20 year old Emmy Rane's baby is kidnapped one day and it tears her life apart. 14 year old Sophie has never had friends or roots because her mother is constantly moving her from town to town. In this novel featuring alternating narratives, Emmy and Sophie both long for freedom. I got this via NetGalley, so my eGalley is expired - otherwise, this review would be full of excerpts because I adored Beth's writing. I'm not exaggerating when I say I got slightly drunk on her prose. She has such a unique way of looking at the world - describing ordinary things and emotions with such clarity and beauty. Of the two narratives, I enjoyed Sophie's the most. I loved her tentative interactions with neighbor boy Joey and his aunts, and how her fear of her mother making them move again really upped the tension. I wouldn't call this the most accessible of Beth's novels, but the patient reader will find it richly rewarding. YOU ARE MY ONLY is available now. Find out more about it at Beth's website. Emmy's home with us again after her button removal surgery. Though she's super skinny, she's eating well and cuddling which is encouraging. My readathon on Saturday was interrupeted by the arrival of my edits for LEVEL TWO (though I did get one book read - YOU ARE MY ONLY by Beth Kephart - which I will post a review for this week). In any case, the next couple of weeks will be very writing/revising centric as I go through my editor's excellent suggestions for making LEVEL TWO the best book it can be. So, Dewey's 24 Hour Readathon is tomorrow and for once it's not scheduled the weekend of the Frankfurt Book Fair! I do need to catch up on my reading before going into my revision cave for LEVEL TWO, but I may not get much reading done tomorrow depending on what's going on with my cat Emmy. For those of you not in my twitter and Facebook loop, Emmy wasn't eating and kept vomiting so we took her to the vet. They did an ultrasound and discovered an inflamed intestine. Today she had surgery and the vet pulled out a button - which was the best case scenario. We're very relieved. And I expect I'll be around to cheerlead a bit too. 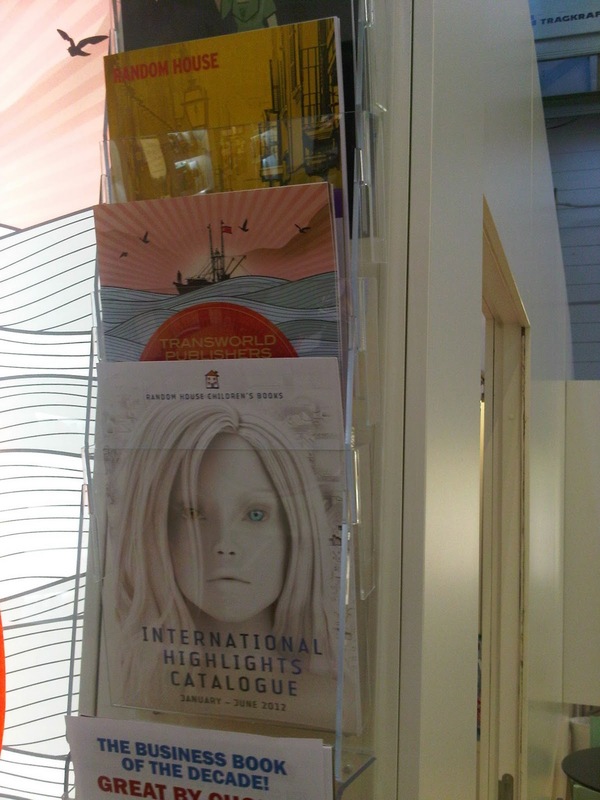 The five days of the Frankfurt Book Fair are always a busy time for us, but this year seemed especially full to me. Not only did we have our good friend Wes staying with us Wed-Sat, but we also met up with Lauren Oliver, Ka-Yam and Kathrin, scoped out the fair for Apocalypsies books, showered our foreign agent Hannah with German chocolate, and even had a few business appointments. This is the year I finally learned what international sales reps do when I met up with Kim from Usborne. She explained to me that her job is to sell copies of books in English - including my book LEVEL TWO - into foreign markets. She told me many territories prefer to buy books that are also being published in the local language, so it helps international sales of your book into a territory if translation rights have been sold into that territory. Also at Usborne, I saw copies of Susanne Winnacker's THE OTHER LIFE (which I am currently reading) and a nice poster of it. 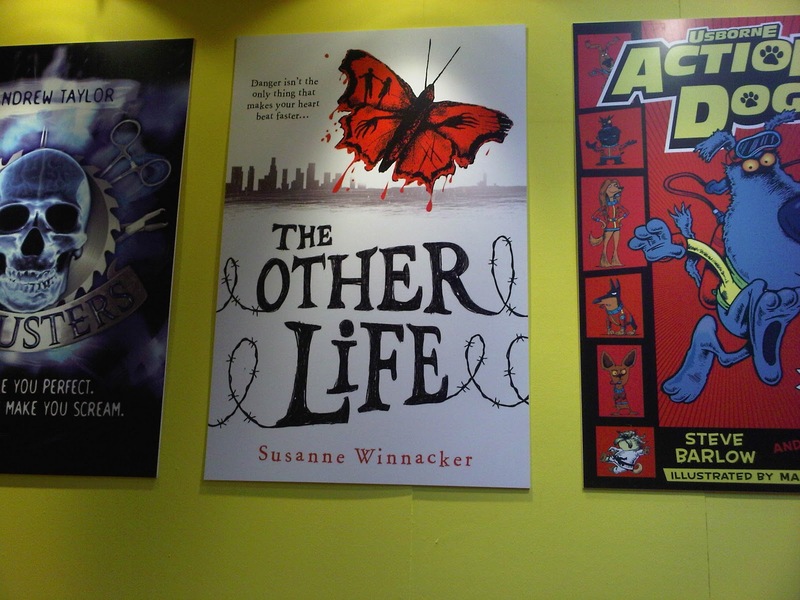 I also got to chat with a sub-rights agent at Penguin as part of an interview I'm doing for the SCBWI bulletin. Sub-rights agents present a publisher's list to foreign publishers hoping to sell rights in other territories. If a US publisher holds World rights to a title, their sub-rights agents handle the foreign rights. 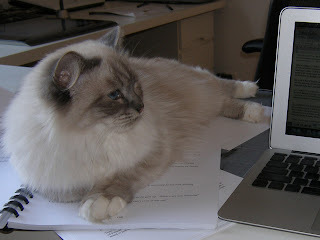 However, many times an author will only sell North American or US rights and his/her agency will handle foreign rights. 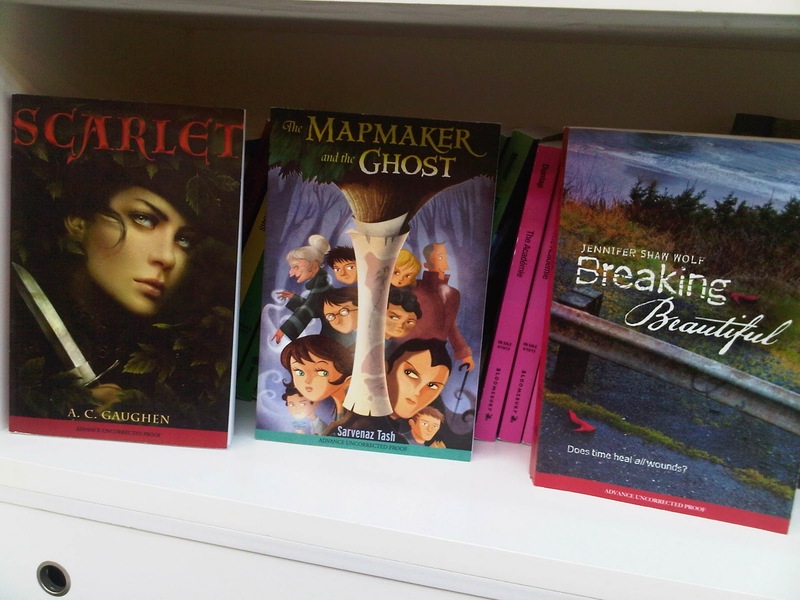 These books usually won't be at a publisher's stand in Frankfurt, even if they are lead titles in the US, and interested foreign publishers will be directed to contact the agency in question about acquiring rights. 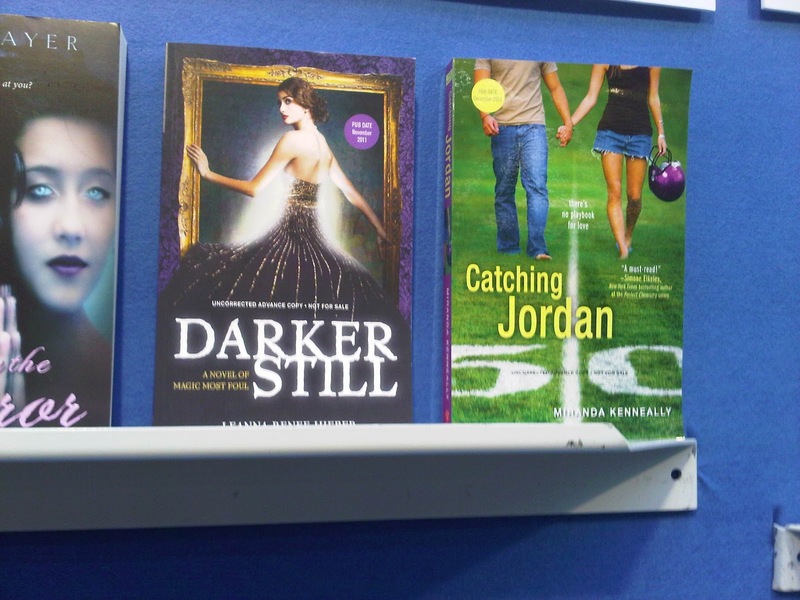 Look what books I saw on Penguin's shelf! 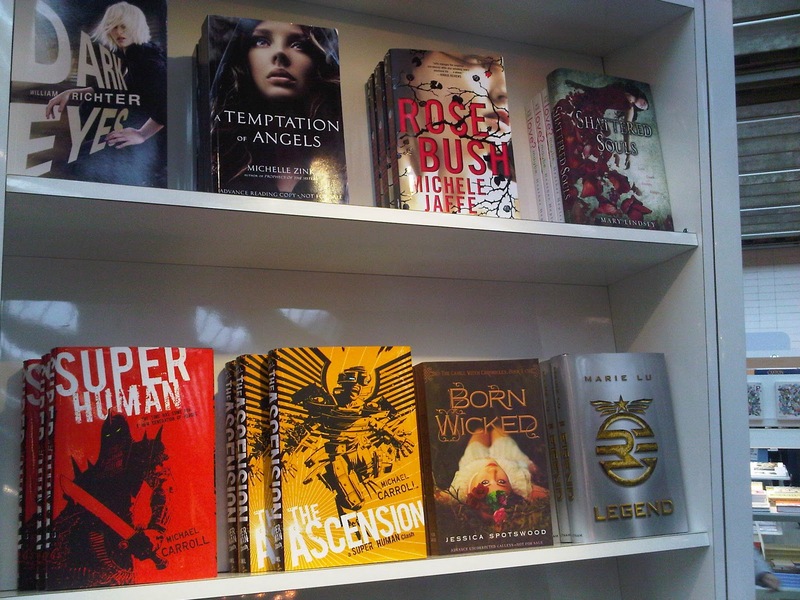 BORN WICKED by Jessica Spotswood and finished copies of LEGEND by Marie Lu. Publishers will often put together rights guides or international highlights brochures in order to give an overview of what titles have sold in which territories already. Here's the selection at Random House, including the Children's titles brochure with Lissa Price's STARTERS on the cover. 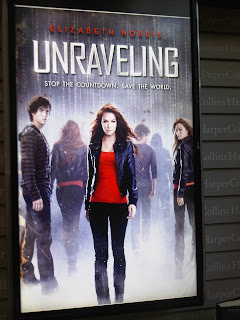 HarperCollins doesn't bring galleys of teen titles with them to the fair, but this year they had several electronic boards that displayed a revolving set of covers including upcoming titles like Elizabeth Norris' UNRAVELING. 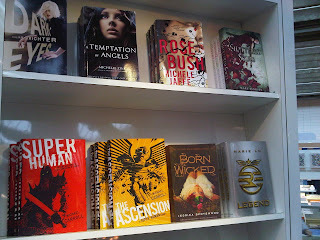 Bloomsbury did have galleys and I was pleased to see three Apocalypsies (debut authors in 2012) represented: SCARLET by AC Gaughen, THE MAPMAKER AND THE GHOST by Sarvenaz Tash and BREAKING BEAUTIFUL by Jennifer Shaw Wolf. 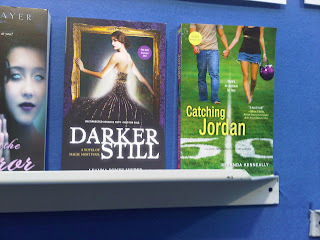 SourceBooks had DARKER STILL Leanna Renee Hieber and CATCHING JORDAN by Miranda Kenneally front and center. 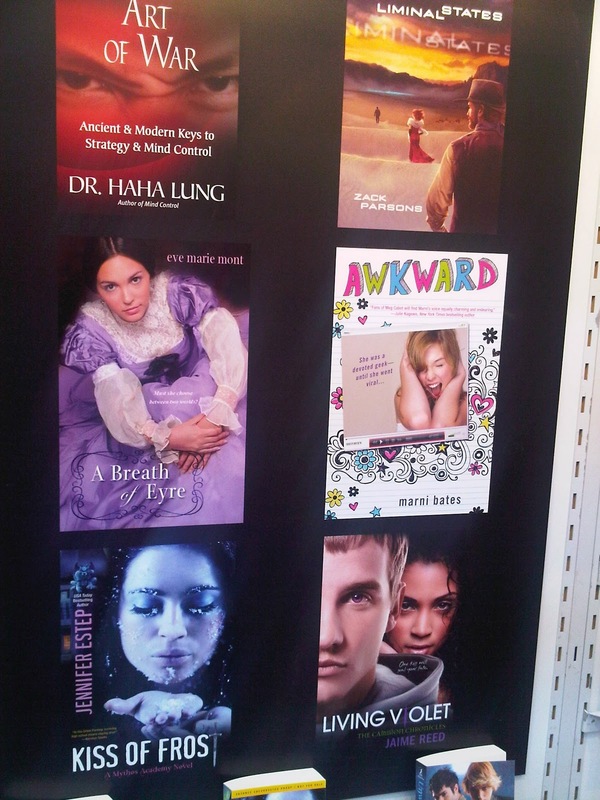 Kensington Teen featured a poster of A BREATH OF EYRE by Eve Marie Mont and LIVING VIOLET by Jamie Reed among others. 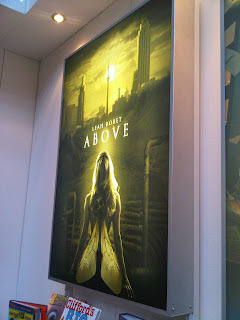 ABOVE by Leah Bobet was the big title at Scholastic, with a light box and galleys. For the first time, Macmillan was giving away a stacks of galleys of four YA titles: SWITCHED by Amanda Hocking, TEMPEST by Julie Cross, AFTER THE SNOW by S.D. Crockett, and ALL THESE THINGS I'VE DONE by Gabrielle Zevin. At Simon & Schuster, I happened to run into Ellen Hopkins who was in town to attend an awards ceremony. That was a lovely surprise! I also walked around the German and foreign publisher halls, delighting each time I saw a foreign translation of a YA book. And guys - they were everywhere! DUST OF 100 DOGS and PLEASE IGNORE VERA DIETZ are two of my all time favorite YA reads, so obviously I was super excited about EVERYBODY SEES THE ANTS. 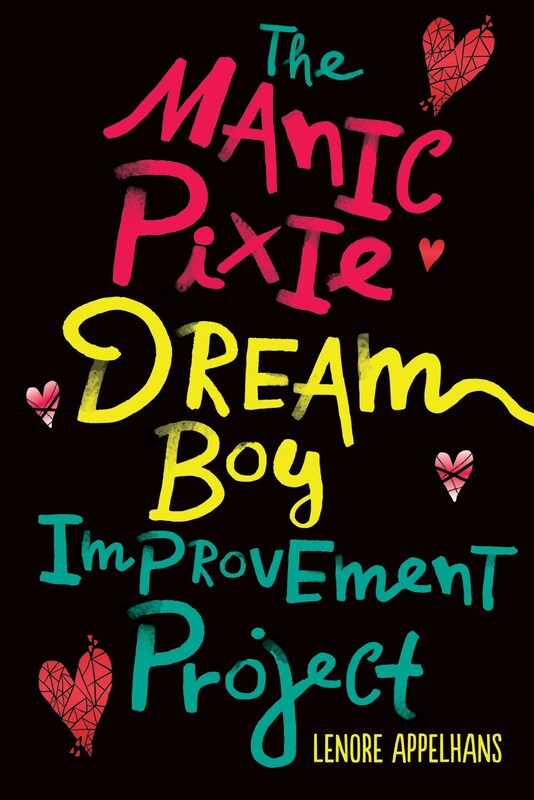 Not surprisingly, AS King blew me away yet again - with a teenage male protagonist who is so achingly real, I can't believe he's fictional. You ache for Lucky. He's bullied, yet still has a positive outlook on life. His parents are at a loss about what to do to help him - which disappoints him but doesn't make him sullen. 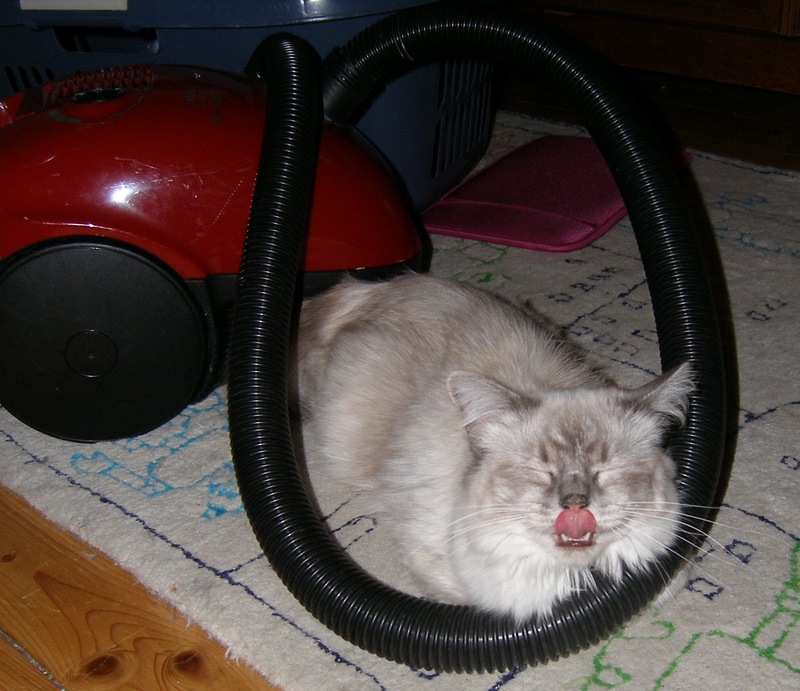 The situations he finds himself in are often painful, but he finds the humor in them. And his dream connection with his missing POW grandfather somehow helps him come to terms with the powerlessness he feels in his waking life. Yes, you need to read this book! Lucky me (and you), I have an interview with Amy today - yay! Let's do it! I love making playlists for books. What do you see as Lucky's theme song at the beginning of the book vs the middle vs the end? This book’s soundtrack is Gnarls Barkley’s St. Elsewhere. I listened to it almost exclusively during the writing of the first draft. Anyone familiar with that album will see some serious connections. (Can you spot the flower that grows out of the sand?) So, “Crazy” would be the beginning. “St. Elsewhere” would be the middle. Not sure about the end. Since that first draft, I’ve made a soundtrack, though, so I can add some stuff. After that comes to Radiohead songs: “Paranoid Android” and “Karma Police.” After that is Stevie Wonder’s “Pastime Paradise.” And some random others: “Ma and Pa” from Fishbone, “Dog Eat Dog” by Adam and the Ants, “Running Away,” “War,” and “Guiltiness” by Bob Marley and the Wailers. I guess of all of these, “Karma Police” fits as the ending song, but only if you see things in a weird way like I do. There is positive in that song that some people might not see. Also what would all the ants dance to? 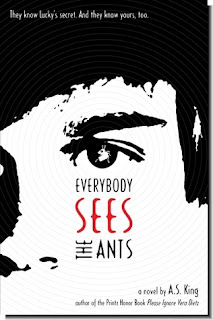 I think the ants would dance to just about anything, depending on their mood. Moshing to punk rock and Waltzing to Mozart are all possible. The ants are limitless in most regards. You always have a magical element in your books - reincarnation, a talking pagoda, dreams which are something more - does your next book continue this motif? I guess it does. As does the next book—though in almost all of these situations, those magical elements could be in the main character’s head, and not real at all. I don’t mean to do this—it’s just the way my brain works. I’m not a very boxed-in or literal person. I believe that anything is possible because no one has proved to me beyond a reasonable doubt that this is untrue. The next book’s slant on this is a little less surreal, though. I think it’s more of a linear book, which was a real challenge in itself. I decided to go linear to challenge myself. I won’t be doing that again any time soon. (Find out more about ASK THE PASSENGERS here). I remember from our chat at BEA that you spend a lot of time at the community pool. Do you have anything else in common with EVERYBODY's characters? I am the vice president of my community pool and Mr. King and I donate a few hundred hours per year to it. 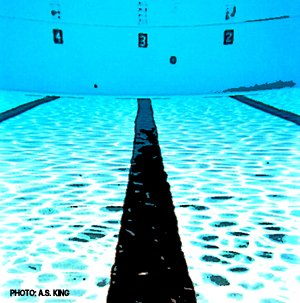 I do swim laps like Lori Linderman…but not 200 a day. I do try to swim in lane three if I can. To prove my dedication to lane three, I can show you a picture. Outside of that, I think being the same age as Lucky’s parents, and having several friends who never had fathers because they were lost in the Vietnam War has made me feel closer to those characters than I normally would feel to them. Also, I love Arizona. I’m writing this interview while I’m in Arizona and I just fall more in love every time I’m here. If the kids weren’t in school up in PA, I’d move here. Oh man. Okay. Look. This is me at 14 or 15. I am rocking a white angora beret. And that bangs-over-the-eye look. It was a toss up between this picture or the one of me with the plaid pants and the Barry Manilow album from my 8th birthday, but this won. 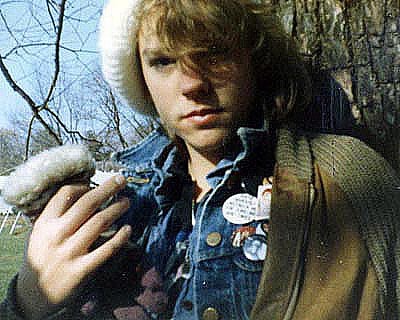 I was SO SERIOUS here. Because I was SO COOL, Lenore. Can’t you just feel the cool? Check out the previous stops on the tour at Amy's website. 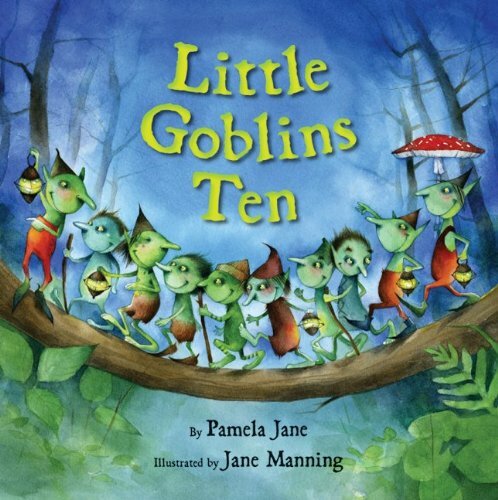 You know I love picture books - especially monster picture books - so I was so excited to get a copy of LITTLE GOBLINS TEN, written by Pamela Jane and illustrated by Jane Manning. With Halloween around the corner, many of you might be looking for new "spooky" books to celebrate the holiday, and LITTLE GOBLINS TEN is a solid choice. I prefer my rhyming halloween tales to be more absurdist and quirky (think THE GASHLYCRUMB TINIES by Edward Gorey), but GOBLINS is sweet and fun in a non-cloying way. "We rattle," said the eight. Catch your interest? You're in luck! I have one hardcover copy to give away to a lucky reader in the US. Just fill out this form by Oct 17th at 11:59 pm CST. For more information about the book, see the author's website. After the death of her father, Liesl is locked in the attic by her evil stepmother. There she makes the acquaintance of Po, a ghost who helps her escape. Meanwhile, Will pines for the girl he always sees in the attic window when he's out at night making deliveries for the alchemist. When a box of ashes gets mixed up with a box of powerful magic, adventure awaits. 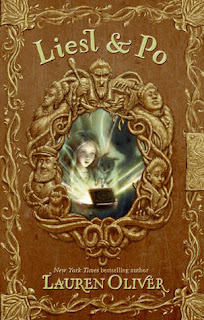 This is the kind of middle grade novel I love - where plot and character threads come together to make a satisfying whole. Thanks to the pitch perfect voice (which is so different from Oliver's YA writing) and many imaginative touches, LIESL AND PO feels very much like a modern classic in the vein of HOLES. It's definitely one that I'll be recommending widely. LIESL AND PO is available in hardcover now. Find out more about it on the official website. I spent most of my September in the US - going to a wedding, visiting family and visiting friends. 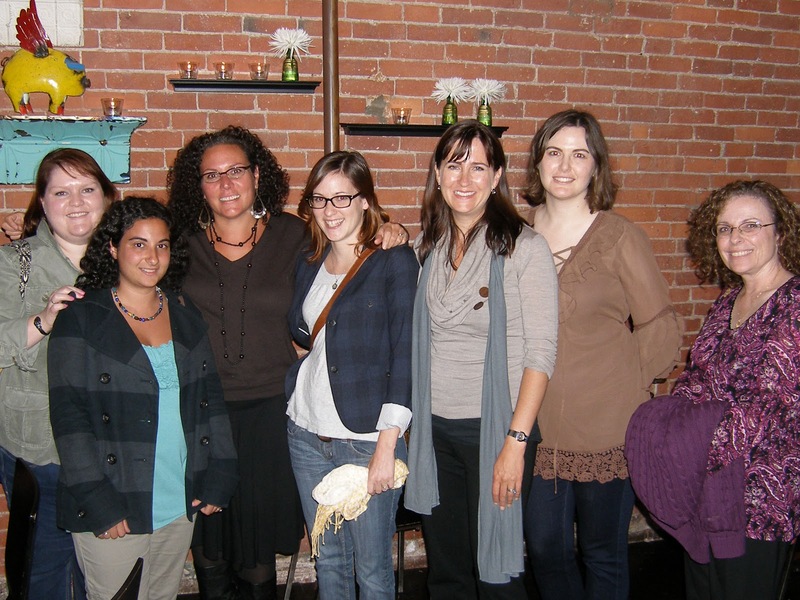 I also got the chance to meet a bunch of Apocalpsies - YA and MG authors debuting in 2012, like I am. In Boston, I got to meet MA and NH Apocs: (l-r in picture below) AC Gaughen, author of SCARLET, Gina Damico, author of CROAK, Hilary Weisman Graham, author of REUNITED, Lauren Morrill, author of MEANT TO BE, Diana Renn, author of TOKYO HEIST, me, Gina Rosati, author of AURACLE and Kathryn Burak, author of HOW PEOPLE DISAPPEAR (not pictured). The restaurant was Zocalo Cocina Mexicana - and it was divine. The best shrimp ceviche I've ever had. In Kansas City, I met Genn Albin, author of CREWEL. We dined at J. Alexander on steak and an entire head of broccoli steamed in butter. And in DC, I got to meet Jessica Spotswood, author of BORN WICKED, and Miranda Kenneally, author of CATCHING JORDAN, who took me to the most amazing chocolate themed restaurant in Metro Center called Co. Co. Sala. Like, seriously, if you love chocolate, you must make it your life mission to go there. Chocolate cocktails!! Looking forward to meeting even more Apocalypsies in the future. Thanks for showing me a great time, ladies! 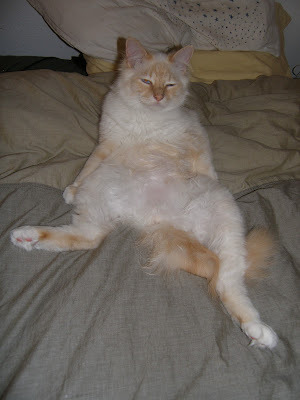 Lola lives in San Francisco with her two dads and a dog named Heavens to Betsy. She loves where she lives except for one thing: the twins next door could move back at anytime. See, Lola has a painful past with Cricket - a boy she crushed on who broke her heart - so when his family moves back in, Lola tries not to care (after all, she has a boyfriend now). But will she once again fall for the boy next door? With its quirky characters and fun set pieces, LOLA gave me the sugar high I was craving when I picked up the book. I really enjoyed getting to know Lola and Cricket, and rooting for them to overcome the roadblocks to their romantic attraction. One of the things which defines Lola is her habit of dressing up in crazy fun outfits, and the way Perkins described them made me want to dig out my old Babysitter Club books and compare Lola's clothes to Claudia Kishi's. Of course, I don't think Claudia ever wore anything as fab as Lola's Marie Antoinette dress! LOLA AND THE BOY NEXT DOOR is out now. Find out more at the author's website.